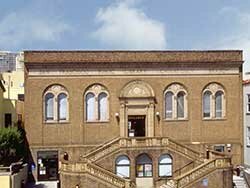 In accordance with the 1901 letter from Andrew Carnegie to Mayor James Phelan, promising $750,000 for a main library and branches, the Carnegie funds were allocated more or less one half for a main library and the remainder for branches. The city paid the difference between the main library's Carnegie share and its $1,152,000 total cost. The branch share was divided among seven libraries. No lots were donated and land costs ranged from a high in densely populated Mission property to a city owned lot in less developed Richmond; in at least one case the neighbors contributed to land costs. Most of the branches have been enlarged very slightly, all have been retrofitted due to higher standards and varying degrees of earthquake damage, and all are included in San Francisco's "List of Architecturally Significant Buildings." And all of the branches still serve as libraries. The old North Beach Carnegie branch is located on the uphill side of Powell Street between Washington and Jackson streets, a residential and commercial neighborhood just a block above Stockton Street, one of Chinatown's busiest streets. 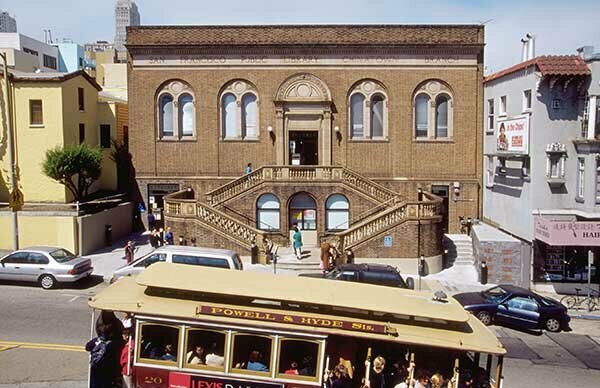 The sixth San Francisco Carnegie branch occupies almost the whole of its 70'x137' lot on a steeply sloping site, said to be the largest unoccupied space available in what was then "the Italian and foreign quarters of the city" and then as now a very populous district. The site was city owned, formerly occupied by a school, but much excavation was required and the total cost was $68,186. Designed by G. Albert Lansburgh in the Italian Renaissance style, it is immediately adjacent to the sidewalk where double stairs rise toward the ends of the building, returning to meet at the central entrance at the second floor level. The words "San Francisco Public Library Chinatown Branch" now reach across the entire front of the building, as another later branch is now called the "North Beach Branch."